The 2013 video marketing trends report published by The Web Video Marketing Council, Flimp Media and ReelSEO is based on survey results from over 600 marketing professionals. The report provides deep insights into how online video is being used by businesses for their marketing and communications initiatives, including website marketing, video email marketing, Video SEO, video advertising, sales lead generation and social media marketing. The Web Video Marketing Council, together with survey partners ReeiSEO and Flimp Media conducted the 2013 online video marketing survey during Q2 and Q3 of 2013. This is the third annual WVMC Video Marketing Survey and Trends Report conducted and published by the Council and its survey partners. The purpose is to gain a greater understanding of how senior marketing professionals and decision makers are using online video for marketing and communications to accomplish their objectives. The 22 survey questions were designed to identify trends in online video production, usage, deployment, and results as relates to business marketing and communications. The survey results provide a means to evaluate current use performance and usage trends for a number of online video marketing applications used such as website video, video email, video SEO and video advertising and video communications. In this report, some comparisons are made to research findings from the 2011 and 2012 Video Marketing Trends Reports. The online survey was digitally distributed to senior marketing professionals through the Web Video Marketing Council and ReeiSEO websites, blogs and email newsletters. The principal sponsor and co-publisher of the Survey and Trends Report is Flimp Media, a leading online video production and video marketing technology company. The survey included 22 questions and responses that were submitted through a secure online survey program. Survey data was collected in an online database for analysis . 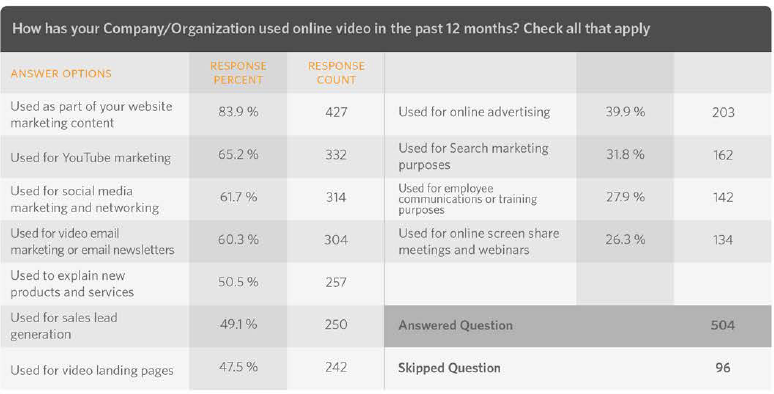 A total of 600 respondents participated in the 2013 Video Marketing Survey, with 52% working for B2B companies, 23% working for B2C companies, 21% for agencies and 4% for nonprofit organizations. Respondents represented a wide range of industry sectors and company sizes. Eighty four percent of respondents indicated they were either the decision maker (51%) or are part of the decision making team (33%). Only four percent of respondents said they do not take part in the decision making process. 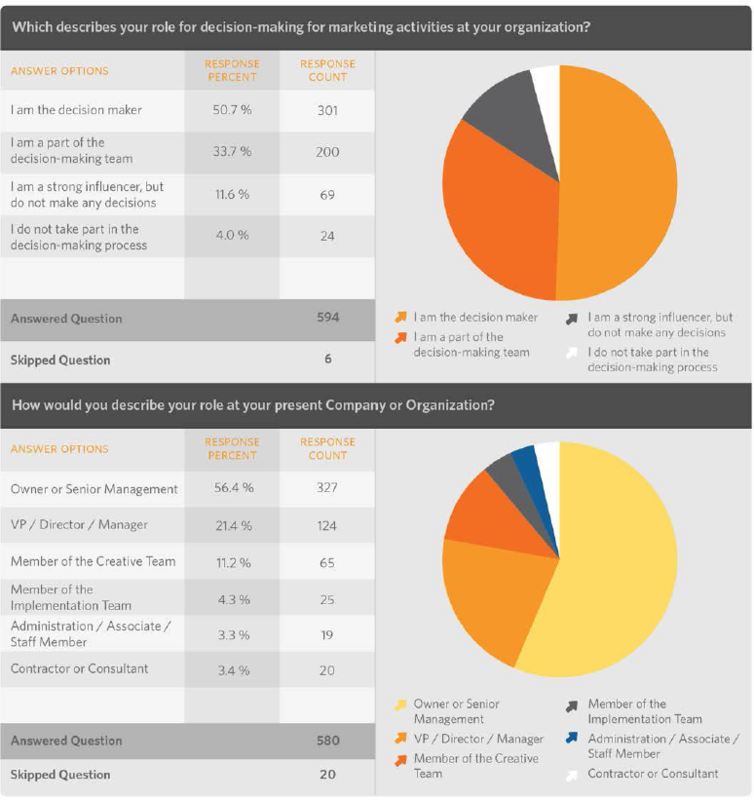 Fully 56% of survey takers described their role as an owner or senior management and 21% checked VP/Director/Manager level. The active involvement of owners and senior level managers in video marketing decision making demonstrates how important online video marketing has become to businesses. 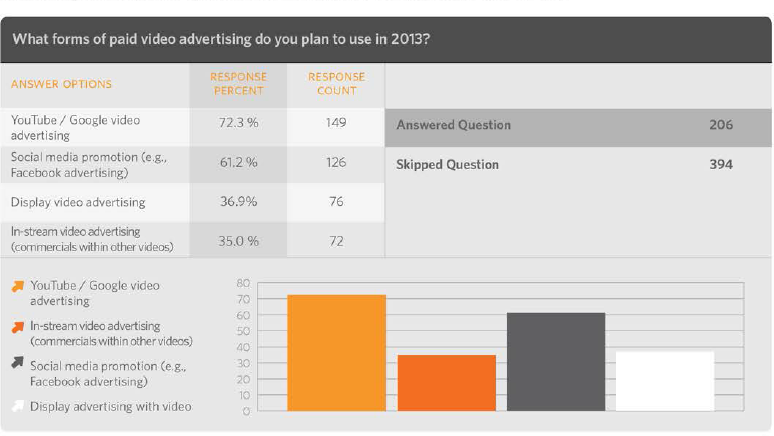 Respondents answered a resounding "Yes" when asked if they planned to use video for online marketing, sales, or communications during 2013. This represents a significant increase from the 2012 survey results, when 81% of marketers indicated they were using video for online marketing. In total, 93% answered affirmatively, 3% are considering using video for online marketing, and 2% are uncertain, leaving only 1% that are not considering using video for online marketing communications. Clearly video has become a mainstream digital medium for online business marketing/ sales and communications. The overwhelming majority of marketers (82%) stated that online video marketing has had a positive impact on their business or organization. 10% felt video has had little impact on their marketing results and 7% have not yet integrated video into their marketing programs. Support for video marketing within companies and organizations is most clearly demonstrated by budgets,with 71% of respondents reporting a 2013 increase in funding for online video marketing and around 15% holding funding at 2012 levels. Only 1% of respondents said video marketing budgets would decrease in 2013. This suggests enormous change in spending from 2012, when 29% reported budgets decreased for video marketing. The reasons most often cited as holding back more video marketing use were the cost of video production (37%) and the difficulty in producing high quality video (27%). These factors were followed by technical challenges in integrating video into marketing programs (22%) and the lack of available video assets (14%). A majority of the marketing professionals surveyed reported using online video in a variety of ways including posting videos to their organization's website (84%), posting videos to YouTube (65%) and posting to social media networking sites (62%). The survey showed that marketers are also actively using video for email marketing initiatives (60%), sales lead generation activities (49%), online advertising (40%) and search engine marketing (32%). In addition, many companies are using video for training and employee communications (28%). Some interesting findings are shown below that highlight some of the changes in the business use of online video for marketing initiatives for 2013 compared to 2012. The four video marketing applications represented in the chart below reflect an overall increase in the use of online video in 2013. Notably, the use of video on company/organizations websites increased 17 percentage points from 2012 to 2013 (67% to 84%). Websites are becoming more dynamic as more companies use video embedded in web pages to explain their products and services, and to engage and convert visiting prospects. Sixty percent of respondents to the 2013 Video Marketing Survey indicated they are using video in their email marketing programs which represents a significant increase from 52% in 2012. In general,the survey respondents represent a sophisticated segment of the online marketing population, which may help explain the high adoption rate for video email marketing. What is the Most Effective Way to Use Video for Email Marketing? The vast majority of Internet Service Providers (ISP's) and email clients in use today do not enable the capability to play and interact with video content embedded directly within the recipients email message. When asked what is the most effective way to use video for email marketing, most respondents indicated that the best approach is to create a link from the email (which can be a thumbnail image of a video) to a video landing page or video in a website (51%) or link to a stand alone video player (24%).18% answered Not Sure. Very few marketers said that linking emails to videos on video sharing sites (4%) or embedding videos directly into emails using animated or video GIF files (3%) was the most effective way to use video for email marketing. 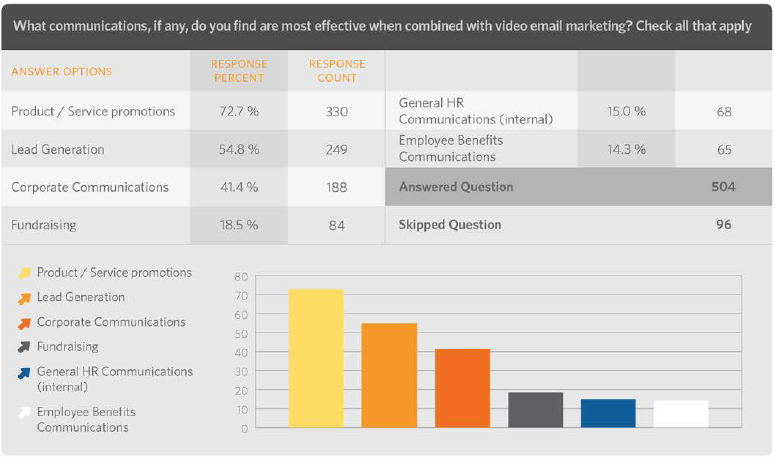 Eighty-two percent of 2013 survey respondents indicated that video email marketing has been either very effective (34%) or somewhat effective (48%) as a marketing method for their business or organization .This represents a slight decrease from 2012,when 88% of respondents answered positively. As more marketers use video for email marketing there is likely to be a decline in viewer engagement rates as the novelty diminishes. Therefore, it makes sense that there would be a modest decrease in the percieved effectiveness of this medium. Marketers stating that video email marketing has not been effective increased from 12% in 2012 to 18% in 2013. One of the key measurements of effectiveness for most sales and marketing initiatives is the impact that a technology, strategy or campaign has on generating revenues. Video email is viewed by a majority of marketers as having a positive impact on prospect purchases and conversion rates. More than 60% of surveyed marketers believe that prospects are more likely to make a purchase or convert to a sale (or response action) after viewing a video email message. A significant number of respondents were unsure (35%) . Less than 2% felt that prospects would be less likely to convert and only 3% said there would be no difference. When asked what types of email communications are most effective for incorporating video, the highest response (73%) was for product/service promotions, followed by sales lead generation (55%) . While much of this report has focused on the use of video for online marketing purposes, there is a significant upward trend in using video email for corporate communications (41%). Among the business communications applications cited for use of video and video email were employee benefits communications (14%),and genera l HR communications (15%). 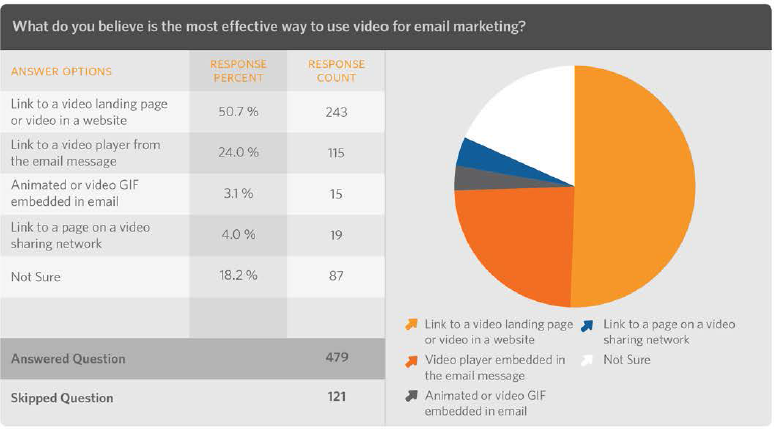 Some respondents also felt that video email is most effective for fundraising (18%). Many free and low-cost options are now available to marketers that want to distribute their video content to online viewers. YouTube is of course the most dominant player in the space,with 94% of respondents in the latest survey using YouTube for sharing their video content. Vimeo, a video sharing platform popular with video production companies, is used by just over half of the survey respondents (51%). Other video sharing sites being used by marketers in our survey, but at far lower levels than YouTube and Vimeo include DailyMotion (11%), Blip.tv (5%), Viddler (5%) and Veoh (4%). In terms of promoting and sharing videos on social media sites,Facebook (87%), Twitter (70%) and LinkedIn (57%) are the most popular sites among marketers surveyed, followed by Google + (47%) and Pinterest (24%). Most online marketers understand the importance of optimizing their videos for online viewing and for achieving results with their marketing search engine optimization efforts. In the 2013 survey, 70% of respondents stated they have spent time or resources optimizing their video content for SEQ purposes. In the chart below, we highlight survey findings that examine the specific practices , strategies and techniques that online marketers are using to optimize their video content for SEQ purposes. The top three video optimization tactics are tagging videos with keywords (77%), optimizing videos hosted on YouTube (75%) and optimizing video file names with search targeted keywords (64%). Surprisingly only 22% of surveyed marketers are creating video sitemaps for their websites. Other Video SEQ practices popular with online marketers include enabling others to embed the company's videos on their websites (55%), posting video content to blogs (51%) and annotating videos with details about the video content (40%). Enabling others to post videos on other sites around the web and posting video content to blogs enables more people to see,comment upon and share videos which can improve website page authority and search engine page rankings for related keyword phrases. Thirty eight percent (38%) of the video marketing survey respondents are using, or plan to invest in, paid online video advertising in 2013. Twenty nine percent (29%) said they were not sure whether they will use video for online advertising in 2013, and one third of surveyed indicated they did not plan to use video in online advertising. The most popular online video advertising destinations cited by marketers in 2013 were, as might be expected, YouTube and Google video offerings (72%), followed by advertising on social media sites such as Facebook and Linkedln (61%). In terms of video ad preferences both display video advertising (37%) and in-stream video advertising are being used by more than a third of the marketers surveyed in 2013. As the 2013 Video Marketing Trends Report results reflect, video has become an important and effective tool for most online marketers. With more than 93% of this year's survey respondents indicating they are currently using video for online marketing, sales or communications, and another 3% saying they are considering using it this year, online video has become a mission-critical marketing and communications application.